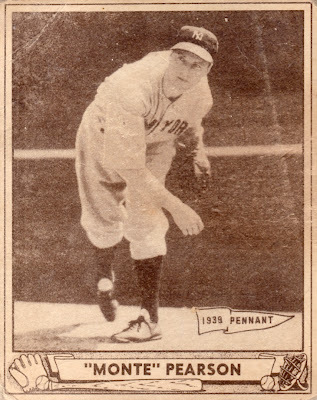 When Gum, Inc. did a 3-year run of prewar baseball (1939-41), they also added some details rarely seen on cards from other eras. The easiest to call out is that "1939 Pennant" marker, which AL powerhouse New York took home regularly in that era. 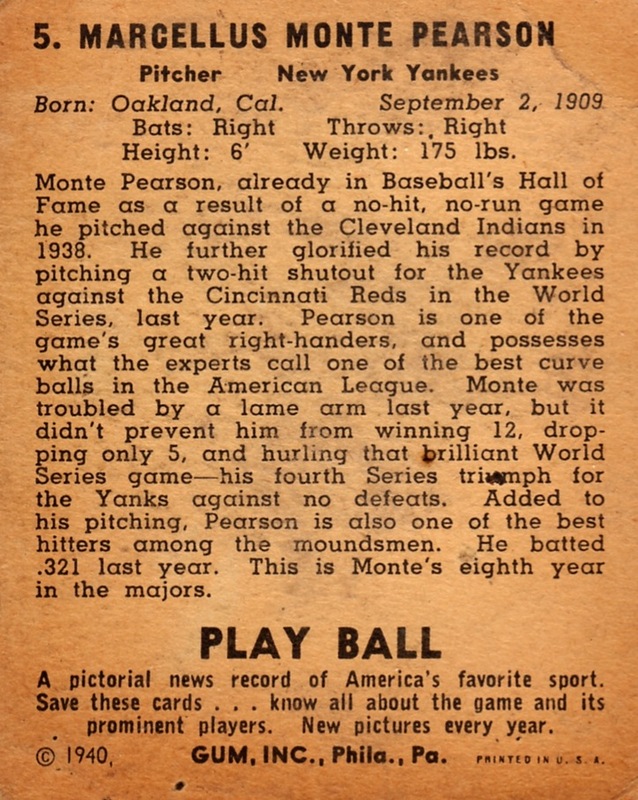 "Monte" did particularly well in 1939, tossing a 2-hit shutout in game 2. He was so efficient, the 4-0 NYY win lasted just 87 minutes. 1939 marked the 4th straight World Series for the Yankees and Pearson, who also threw the 1st no-hitter in Yankee stadium, a 13-0 whitewash of Cleveland on August 27, 1938 (more at This Day In Yankees History). Monte won 63 games in 5 years for the Bronx Bombers, working as a solid 3rd starter behind dominant stars Red Ruffing and Lefty Gomez. Gum, Inc. published 3 card sets from 1939 to 1941. 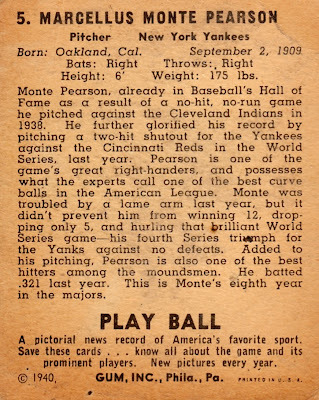 In 1940, they tried to punch up the front with ornate borders and player nicknames (like "Monte" for Montgomery), but it feels lackluster compared to 1939's "basic black" and 1941's hand tinting. Nicknames work well when it's "Hot Potato" Hamlin and "Stormy" Weatherly. Plain eponyms like "Ted" (Williams) and "Mel" (Ott) fall a little flat. 1940's 240-card checklist dwarfs sibling 1939 and 1941 card counts. They took an unusual step in the "high series" (#181-240) by featuring retired and HOF players like Joe Jackson and Honus Wagner. Many of these cards show a contemporary 30s-era photo, forcing modern collectors to spend a lot of money on old-looking guys. While a unique set feature, finding all those stars--and on unflattering cards--makes building the set frustratingly slow. Fakes / reprints: Several modern publishers reused the 1939-41 Play Ball designs with both current and past stars. While not reprints, they do muddy the waters by including new poses of older players. I've also seen faked Hall of Famers in the marketplace, detectable by different paper stock, spotty scanning or inkjet printing, and sloppy "aging" (weird creasing or coffee spots). The Network54 forums tackled several Play Ball fakes over the years, including these examples. Play Ball's the best-known option for early cards of Ted Williams and Joe DiMaggio, so take care when buying stars or type cards. If the dealer doesn't know much about what they're selling, I recommend finding one who does.